Have you ever want to send a gift to someone that is 50,000 ft in the air? Someone had a long day at work. We saw a need to speed up the process of having things deliver to you on the plane faster and be able to send a gift to a love on a flight. You can send a gift to anyone in any part of the world except for on a plane. Those huge and clunky carts on the plane always block the walk away while someone is walking to the restroom. You can pre-plan things you would like to buy and have it delivered to your seat. The app will allow you to purchase things from the catalog using Panasonic's API. We built it using rails, Panasonic's Api and Mapquest's Api. We originally build the app with react native however Panasonic's API doesn't work with it. So we had to pivot it over to an web app instead of an mobile app. We finally made a decision to pivot over to a rails app and got the Panasonic's API working fairly quickly. We learned that the Panasonic's API is no good for react-native and Radix's website forwarding doesn't work. Come on Radix we want to win the $5000 but it didn't work. I would like to see our team add Braintree's Api on it for payment part. 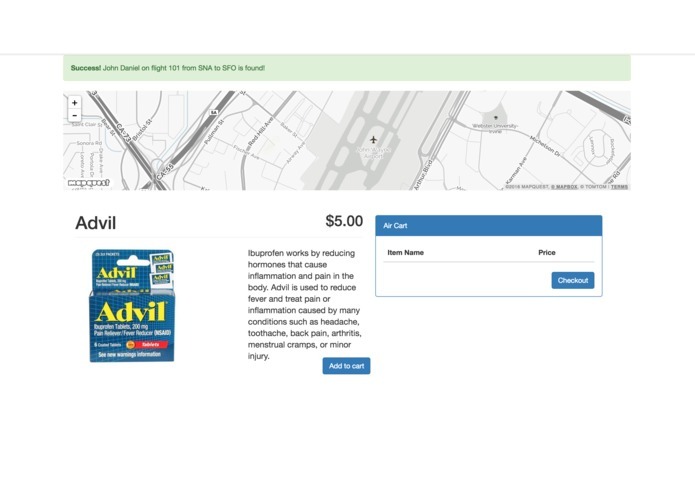 Our app is a concept to revolutionize how we buy things on the plane. Who use paper catalogs any more? Why is the only place you see it is on a plane? Did you ever wanted to buy someone and don't feel like walking around the whole airport finding it? Wouldn't it be great to buy things and have it delivered to you when you're sitting down? What if there's an app you can purchase a pillow, blanket, and a cup of hot tea for your wife while on a flight coming back home because she's tired after a long meeting? I worked on the frontend to continuously improve UX through styling and listing a card of each product with consistent sizing and positioning.